← Culinary, Fragrant & Medicinal HERBS ! We Master Gardeners have a mission to educate and inform our fellow gardeners about the best and most up-to-date principles for creating and tending good gardens. Heeding the call to garden in an environmentally sound manner is a worthy objective. We strive to plant native species, use less water, and avoid the need for chemical fertilizers by composting and choosing the right plant for the right place. But beyond that, most of us are driven by something else entirely, I suspect. As a friend said recently, ultimately, we love gardens because they are beautiful. We garden to achieve that space that gladdens our eyes, lends peace to our souls, and calms our harried minds on days when life seems to run away from us. Because no matter how rushed or hurt or grieved or worried we may be, when we step out into the garden on these cooling fall mornings and our eye falls on a bee-laden aster, or a butterfly hovering over the late-flowering summer phlox, or even a common robin perched on the edge of the birdbath, a quiet happiness washes over us. 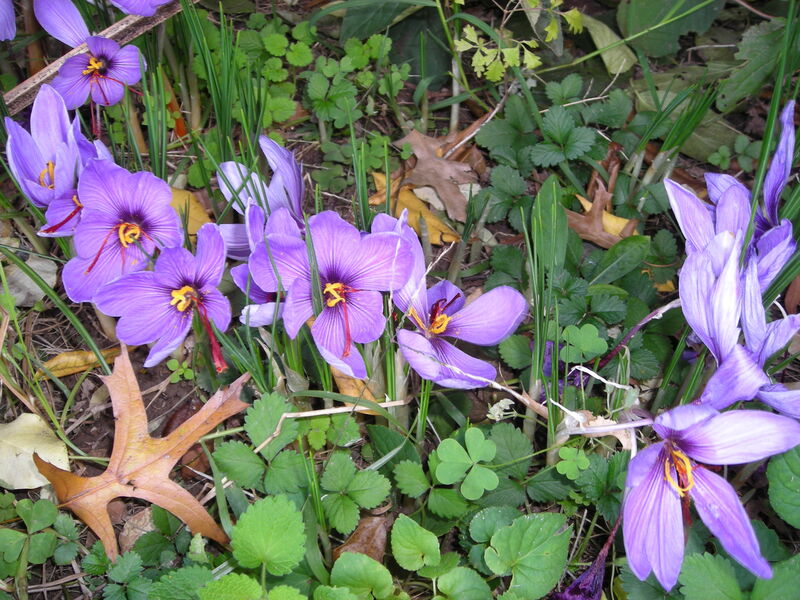 The colors in that native bed are melding into a fall riot of yellow and purple, white and pink, the berries are reddening on the hollies, and here and there a colchicum or an autumn crocus is creating its startling flush of lavender or white or yellow. Lavender, rosemary and hyssop release their scents when lightly brushed. Seed heads ripen and pop open to reveal little brown or black reservoirs of future life, sometimes attached to fluffy down or wings to propel them into the future. The insects are stocking up on nectar and pollen and chomping on leaves to use up all that’s available now, before winter stops it all. It is a spectacle and a joy to slow down and savor it. We seek out the tables or benches that anchor our garden spaces, and we savor the warmth of the autumn sun and the slanting shadows it throws, and let the peace of our gardens surround us. Later, we can attend to the pruning and cutting, digging in or clearing debris. Later, we can think about where to put those bulbs, where we need more spring ephemerals next year. For now, let us just enjoy. This entry was posted in MG in the Garden, The Long View – Meditations on Gardening and tagged Alexandria, Arlington, fall gardening, gardening, hollies, lavender, Master Gardeners, nectar, pollen, rosemary, summer phlox. Bookmark the permalink.